To find the best organic baby formulas of 2019, we interviewed over a dozen moms who use organic formula exclusively and on a daily basis. We also scoured the internet for reviews and testimonials and did all the dirty work for you in terms of researching ingredient lists, taste-testing, and finding the best options for the best prices. If you're looking for organic foods, check out our reviews of organic baby foods and purees. Below we list the top 5 organic baby formulas we found, followed by our in-depth reviews of about 10 different options. Infant formula comes in dozens of brands and varieties, and figuring out what's best for your baby can be a daunting task, especially for discerning parents who want a natural formula without preservatives, artificial flavors, artificial colors, or artificial sweeteners. Organic formula contains all-natural ingredients, plus they are sourced from farms that feed their cattle only organic foods, without traces of pesticides, herbicides, growth hormones, steroids, antibiotics, or other harmful additives. Non-organic formulas have some truly scary ingredients: vitamins derived from petroleums, sulfate-based pesticides, herbicides, and fungicides, corn syrup solids, etc. But organic formula options tend to be quite a bit more expensive, especially at the local grocer, and also vary widely in quality and taste. Here are the Best Organic Baby Formulas of 2019! This is an outstanding option for babies who seem to have some issues related to digesting dairy, such as gas, reflux, or bloating. This is a lactose-free organic and kosher baby formula, with high levels of essential fatty acids that the baby's body converts to DHA (an omega-3) and ARA (an omega-6). Moms report that this formula is a real life-saver! To our knowledge, it is the only organic formula for sensitive stomachs on the market, and parents rave about its flavor - much better than the Similac Sensitive or Enfamil Gentlease, and it has no corn syrup or genetically modified ingredients. It also uses naturally-sourced rather than petroleum-based vitamins, such as vitamin E acetate, and uses brown rice syrup instead of corn syrup solids. Note that while we are fully aware that the label says "Toddler Formula," the manufacturer claims that this is only because they suggest breastfeeding for babies under 1 year old. It has nothing to do with ingredients, and its suitable for newborns (but always check with your pediatrician first). Some moms suggest that this is a fantastic option to try before having your baby dosed up with prescription antacids such as ranitidine. Negatives? Like any baby formula, some parents suggest that it can cause mild constipation, but definitely not as bad as any of the non-sensitive options. Interested? You can check out the Baby's Only Formula here. This is one of the only organic formulas on our list that is specifically targeted toward newborns and infants, rather than just toddlers. This Lebenswert formula sets the gold standard for how organic formulas should be sourced and manufactured. 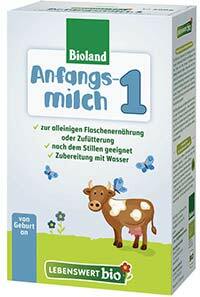 Based in Spain, the Bioland company has been making the top-rated European organic infant formula for several years. The Lebenswert formula is based on organic skim milk, organic whey, organic vegetable oils, organic lactose, and vitamins and minerals. With skim milk as the first ingredient, it seems like a better option overall than several other baby formulas on this list that use things like brown rice syrup (the Baby's Only options), or lactose (Plum Organics, Happy Baby, and Earth's Best). So rather than using a sugar (lactose is a milk-derived sugar, and brown rice syrup is a sugar as well) as a primary ingredient, this organic formula uses milk itself and then adds in the fats and sugars later. And there's other stuff to feel good about - the farms and ingredients are certified organic, they only use high-quality raw ingredients, and the company uses its profits to fund conservation of natural resources. 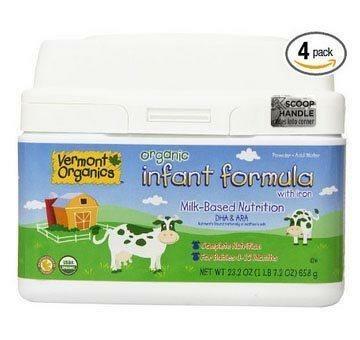 Even better, because this baby formula is suitable for use from birth onward, it is great for exclusive bottle formula feeding, which makes it a really unique addition to the organic baby formula market. In our testing, we found it to taste great without being too sweet or oily, mix well with water or breast milk, and it caused the least gas of all the other formulas on this list. And that's impressive because some of them are also really great at that. So why isn't it #1 on our list? Well, this is a baby formula intended for highly discerning parents who are willing to pay a bit more money for the perfect baby formula. At this point, you can purchase it from Europe with free shipping, and it's about $30 for a 17-ounce package, which is pretty pricey. Shipping took about a week to arrive in Massachusetts, and the company is super responsive and helpful. This is the same company that will ship you the excellent Goat Milk Holle Formula, and the Hipp Organic Formula, both also excellent European formula options (the Hipp formulas include prebiotics to aid digestion). If you're intimidated by the fact that the information on the box is not in English, just click the "Translated Labels" button below each product on their website (like here, right below the "add to cart" button). Interested? You can check out the Lebenswert Organics baby formula here. This is the first year that the Plum Organics option is showing up on this list, and we're really excited to see another fantastic organic baby formula option on the market! The first thing to point out is that, like the Baby's Only options, there are no corn syrup solids in the Plum Organics formula. Instead, they used lactose from cow's milk to provide sweetness; lactose is the most abundant carb in human breastmilk, so this was a nice touch. It's kosher dairy, gluten-free, and contains no genetically modified ingredients. What it does include is a thoughtful blend of organic lactose, nonfat milk, oils (palm, coconut, soy, etc. ), whey protein, and a ton of vitamins, minerals, amino acids, omegas, and antioxidants. Yes, it includes DHA (Omega-3) and ARA (Omega-6) to promote development. It also contains important levels of folic acid, choline, calcium, and vitamins D, E, and K. This is truly an infant formula, suggested for use from birth (not for premature babies, however), all the way up to about 1 year of age. The only downfall here is that they use palm oil as an ingredient, and there is some evidence that babies fed formula with palm oil show decreased bone density, presumably because it decreases calcium, palmitic acid, and fat absorption by the baby. A review of this research can be found here. Of course, nobody knows whether the bone density differences persist past the first year (when varied foods are introduced), and even if they do persist, whether they lead to any functional impact on development. Thus, if you're solely feeding with formula, you might want to consider a formula that has a different predominant oil (like the Baby's Own options). Overall, however, this is a very well tolerated baby formula that is worthy of its position on our list. Interested? 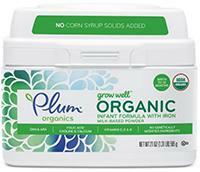 You can check out the Plum Organics baby formula here. This option is very similar to #1 above, but it's not the sensitive version so it contains regular lactose levels that you'd find in any dairy formula. Unlike any other formula, however, it uses naturally-sourced rather than petroleum-based vitamins, such as vitamin E acetate, and uses brown rice syrup instead of corn syrup solids. It also includes naturally sourced DHA (an omega-3) and ARA (an omega-6), which some research suggests can promote brain development. Note that while we are fully aware that the label says "Toddler Formula," the manufacturer claims that this is only because they suggest breastfeeding for babies under 1 year old, and that it contains high levels of the milk protein casein rather than whey. Our pediatrician said it's suitable for newborns (but always check with your pediatrician first). Negatives? Like any baby formula, some parents suggest that it can cause mild constipation, likely due to the iron fortification. Maybe add a couple drops of prune juice to the mix to get things moving! Interested? 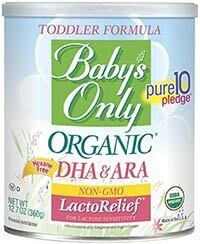 You can check out the Baby's Only Toddler Formula with DHA & ARA here! This is the original organic (and kosher) baby formula to the market - or at least the first widely distributed option. This contains DHA and ARA to promote eye and brain development, and contains no growth hormones, antibiotics, steroids, or pesticides or herbicides. 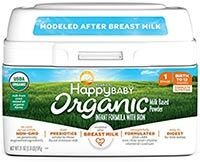 This is a very well-reviewed formula option, and parents report that their babies have an easy time digesting it, and like that it's a bit more affordable than the options at the organic grocers. There is also a low lactose version, called the Sensitivity Infant Formula. We put this down a bit on our list because parents don't like that there are added syrup solids (sugars), and that Earth's Best uses hexane for extracting DHA and ARA from lab-grown algae and fungus. Hexane is a solvent that is also used as a chemical degreaser and industrial cleaner and is a known neurotoxin. Some think there may be trace levels in baby formulas containing DHA and ARA extracted using hexane. We prefer to stay out of that debate given the lack of sound scientific data one way or the other. Interested? You can check out the Earth's Best baby formula here. This baby formula is a great option, especially if you're planning on using formula from birth. It is organic, non-GMO, and contains no corn syrup solids or other sweeteners. Its ingredients include lactose, milk, several oils (including palm, soy, coconut, safflower, sunflower), whey protein concentrate, soy lecithin, prebiotics (FOS and GOS), essential fatty acids (DHA and ARA), and a ton of beneficial vitamins and minerals. These include iron, zinc, choline, vitamin D, and calcium. It is also kosher and the packaging and formula itself contain no BPA. There's nothing strange in this formula, and the dairy cows used to make the milk for this formula are only fed organic diets. About 100 calories, 2 grams of protein, and 5 grams of fat per serving, this formula is very similar in composition to breast milk. It also doesn't taste much different from it, though some of our testers thought it's not quite as sweet. And while it does contain iron, it doesn't contain so much iron that it inevitably leads to constipation. 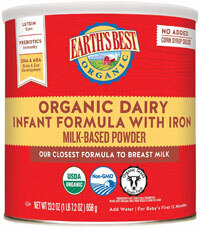 So, overall this is an excellent addition to our best baby formula list for several reasons. Cons? Well, we did find it difficult to dissolve in water or breast milk. It definitely takes a lot of shaking and stirring to get it to fully dissolve and not leave any clumps. So that was a bit more work than we may have desired, at least relative to the Earth's Best and Baby's Only options. If your baby has any food-related sensitivities, this does contain soy (just FYI). Also, like the Plum Organics option, above, it contains palm oil, which is a bit controversial for use in baby formula. And it's expensive, coming in at well over $1 per ounce. Interested? You can check out the Happy Baby formula here. This toddler milk (toddler formula for age 12-24 months) contains a lot of great non-GMO organic ingredients for healthy brain and eye development, including choline, DHA, and ARA. Note that the DHA is not sourced with Hexane, so that's definitely a plus. The first ingredient is milk, which we like, and the second and third ingredients are vegetable oils and glucose syrup solids. Note that "glucose syrup solids" is usually just a crafty way of saying corn syrup solids (the Vermont Organics product below does the same thing). 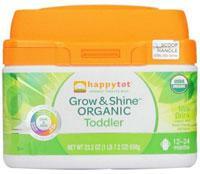 The Happy Tot brand makes some seriously good baby and toddler foods, which can be seen here. So we were expecting a lot from this toddler milk. We weren't disappointed, but we also didn't think it lived up to the Happy Tot brand reputation for taste. In our testing, the taste wasn't quite on par with the Earth's Best or Baby's Only options, but that's really up to your baby to decide! This Happy Tot Toddler Milk comes in a bit less expensive than the others, around 80 cents per ounce. While this is last on our list, not only are these the top formulas on our site, they're really the best ones out there in terms of wide availability, and decently reviewed for quality, ingredients, taste, and suitability for sensitive tummies. This is the last on our list, at #8, but that doesn't mean it's anything to scoff at! Like all the other options, the Vermont Organics option contains no growth hormones, antibiotics, steroids, or pesticides or herbicides. It does contain DHA and ARA to promote eye and brain development, but these are sourced from algae and fungi using the hexane extraction method, which has some parents running for the hills and choosing the Baby's Only options (above). It also contains corn syrup solids as one of the first ingredients - yes, it says "glucose syrup solids" but that's usually just a crafty way of saying corn syrup solids. Some parents also report that it has a slight fishy odor and their children refuse to drink it. Conclusions: Here's what we learned by putting together this formula guide: there are very few organic formulas on the market. Especially organic baby formulas that are suitable for newborn infants, those are especially rare. The Similac organic formula was recalled a couple years ago, so that put a bad taste in people's mouths about large companies attempting to pull the fleece over people's eyes and claiming organic while being a bit careless in manufacturing processes. Some formulas labeled as organic contain some questionable, non-organic, ingredients such as petroleum-sourced vitamins and sulfates. Not certain how some companies are getting away with it, but likely because the organic food market is not yet well-regulated. Another more recent option for toddler formula is goat milk formulas, like the Kabrita Non-GMO Goat Milk Toddler Formula. We love that goat milk formula, but it's not a fully organic product so it's not eligible for inclusion on this list. 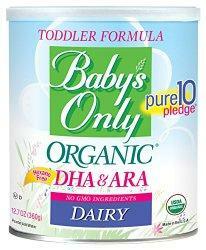 With all that said, we have done our best to find the best organic baby formulas of the year. If you have any questions or comments, we invite you to visit us on our Facebook page and send a message!